...a Severe Thunderstorm Warning Remains In Effect Until 745 Pm Cdt For Northwestern Calhoun...southern Victoria...southeastern Goliad And Northeastern Refugio Counties... At 730 Pm Cdt, A Severe Thunderstorm Was Located Near Mcfaddin, Moving East At 40 Mph. Hazard...60 Mph Wind Gusts And Penny Size Hail. ...Read More. 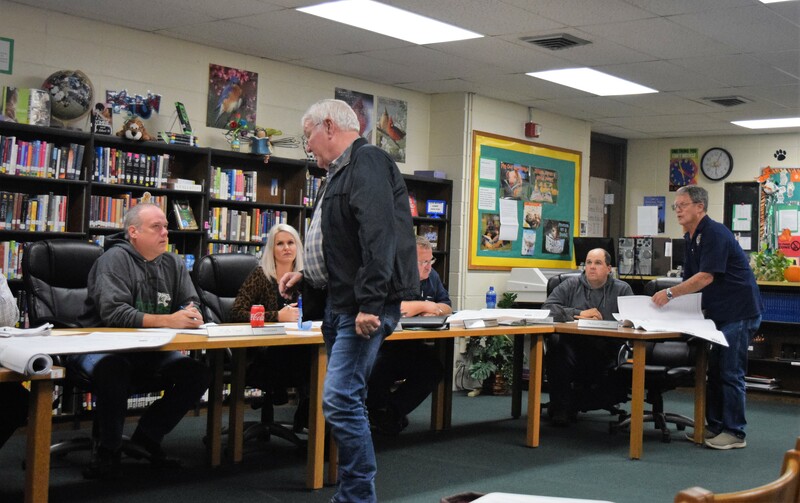 LATEXO – During a regular meeting of the Latexo Independent School District Board of Trustees, held on Thursday, Nov. 8, the board addressed an issue which has been plaguing the district for many years. The issue is the logjam of traffic before and after school. As parents try to drop off or pickup their children, a bottleneck occurs creating long lines of vehicles coming and going from the two LISD campuses. As the meeting began, Board President Kelly Nicol called on Bob Thurber with KSA Engineers to address the trustees. “We have been working on a project to help relieve the traffic issues you have here at the school. That is to construct a road from your parking lot going south to the county road. It’s about 2,300 feet. The city applied for a grant and we assisted the city with that grant. We were fortunate enough to get it,” Thurber explained. Following his presentation, the engineer presented several sets of blueprints for the board to review. After addressing several other agenda items, the board retired into executive session. When they emerged from behind closed doors, the board voted to proceed with allowing the city to acquire the property in order to build the roadway. As the meeting continued, Business Manager Jo Lane gave a report on the district’s performance pertaining to the Financial Integrity Rating System of Texas (FIRST). “The goal of the FIRST program is to achieve quality performance in the management of the school district’s financial resources. A goal made more significant due to the complexity of the accounting associated with the Texas school finance system,” Lane said. She explained one of four ratings were assigned to Texas school districts. The ratings are: A-Superior; B-Above Standard; C – Meets Standard; and F- Sub-standard. The business manager further indicated LISD received a score of 98 out of a possible 100. A resolution establishing Interim Superintendent Gary Gazaway as a district investment officer was approved. Approval of the superintendent’s expenses to attend the Midwinter Conference was given by the board. The dates of the January 2019 and March 2019 board meetings were moved to Jan. 17 and March 7.